We talked about how much this painting shows detail. It is almost like a photograph. Partly this is because after the Reformation artists are not making art to teach lessons, they are making art to be beautiful. Pictures don’t tell us something, they show us something, like a photograph, and so they have to show it very, very well. Durer has made this hare very lifelike and very precise. If you wanted to, you could count all the hairs on the hare. He has also positioned the hare at an angle to show us something of foreshortening, to show us that he can draw something from any angle- even have it coming out of the picture. Compare the flatness of the Glico man to the depth of the hare. Finally, Durer has left out any background. 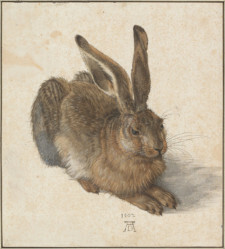 He wants us to look at the hare and how well he has drawn it. And he wants us to know that he has drawn it. There is no background, but there is a signature. This is a meishi. When we want the best, we know who to contact. Durer, A. (1502). Young Hare. Vienna, Albertina.